Trincomalee is one of two Leda class frigates built for the Rpyal Navy by the East India Company in Bombay (now Mumbai). She was built of teak, a highly durable timber which largely accounts for her survival. Trincomalee was launched in 1817, 12 years after Trafalgar and the death of Nelson. and was designed to carry 46 guns. She was not commissioned until 1847, when her obsolescence was offset by the good condition of her teak hull. She served in the north and south Atlantic, and the Caribbean, and then in the Pacific. In 1860 Trincomalee became a drill ship, and was then the training ship Foudroyant until 1986. Restoration began the following year and was completed in 2005. Trincomalee is now the oldest ship afloat in Europe, and still retains over 60% of her original timber. Welcome to Hartlepool! Tues 10 August 2010. 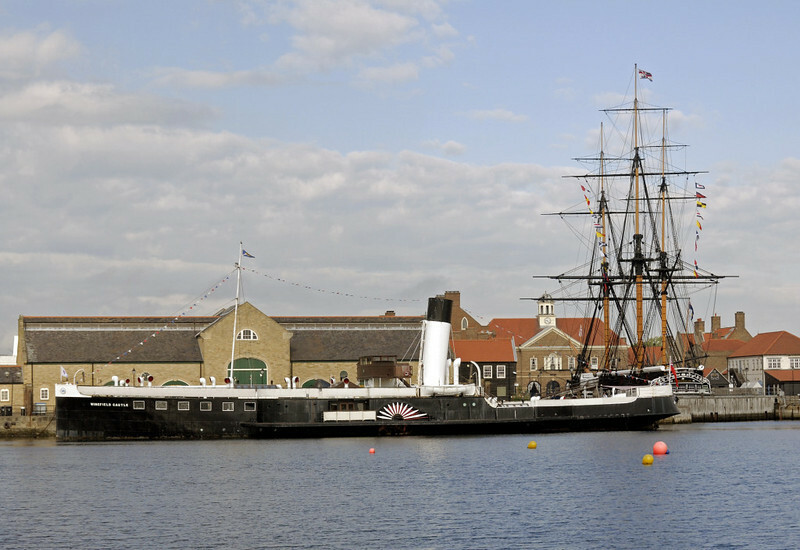 Hartlepool is home to two historic ships, paddle steamer Wingfield Castle and Royal Navy frigate HMS Trincomalee. Wingfield Castle was built for the LNER in 1934 at Hartlepool for the Hull - New Holland ferry service across the River Humber, along with Tattershall Castle. They were withdrawn in 1972 and 1973 respectively. In 2013 Tattershall Castle survives in central London.